Modern wheel loaders are designed for increased productivity under all conditions. It is important not to lose these properties after installing a weighing system. The Loadtronic 3 weighing system will never tell you to slow down, even on rough surfaces. It helps your company save time and money and increases your profit. This is possible because the Loadtronic 3 has the built-in dynamics system. Drive as you normally do, move fast and flexible. Load more tons per hour. Instead of giving away valuable goods, load the correct amount every time. 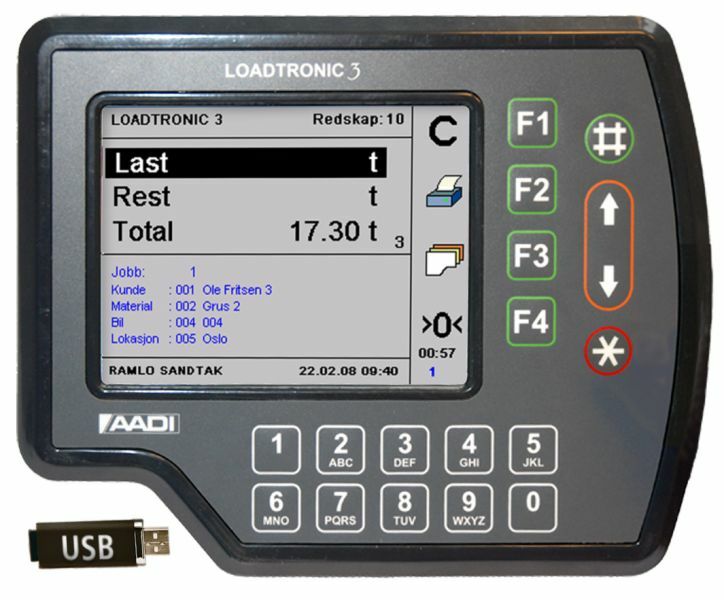 Loadtronic 3 has an operator friendly user interface with built in help functions. This is a dynamic and accurate weighing system for all wheel loaders. Loadtronic 3 scales are class approved according to European regulations and are ready for legal trade. Trucks can move more efficient and there is no need for a scale house. Loadtronic 3 automatically registers to whom and exactly how much you are loading. Data are saved and can be printed as a receipt. You may also copy data from Loadtronic 3 to a USB memory stick making it easier to transfer data to the back office system. This can also be done in reverse, transferring customer data from the back office system to Loadtronic 3. Loadtronic 3 can be calibrated with up to 10 different attachments. Each attachment is assigned its own ID number. On a single command; the system automatically corrects for the change in the attachment's tare weight and load location. Normally there is no need for an operator's manual. Just press the help button and the Loadtronic 3 system communicates back to you. Approved according to MID 006 OIML R51.